FILE - Soldiers of the 21st Motorized Infantry Brigade patrol in the streets of Buea, South-West Region of Cameroon on April 26, 2018. The war that Cameroon's government declared on armed separatists fighting for the independence of the English-speaking regions from the bilingual English/Francophone country is leaving many casualties among both the military and the insurgents. Hundreds have died in the fighting that is now in its sixth month — and hundreds more are missing. 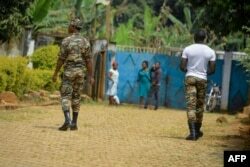 A military ambulance rushes to the Yaounde military hospital on Tuesday with four people wounded in a flare-up of fighting in the English-speaking southwestern towns of Bangem and Mamfe. Among the medical staff on duty is Doctor Kaldadak Koufagued. He says they got word that a military helicopter was bringing three Cameroon army soldiers and a notorious suspected armed separatist who sustained fractures in a heavy gun battle. He says all staff in the military hospital are mobilized to receive patients as soon as they receive signs of casualties from the war front. He says that in treating the wounded, they do not distinguish between Cameroon soldiers or armed separatists, but once treated, the military takes suspected terrorists and armed separatists into custody so they can face charges in the military tribunal. Koufagued says three of the wounded Tuesday have gone into hypovolemic shock, a life-threatening condition that occurs when persons lose more than 20 percent of their blood. Another of the wounded fighters is suffering from psychological trauma. There are about 60 wounded persons in the hospital. VOA is only authorized to interview soldiers who are now recovering. Sergeant Achilles Nomo Atouba says he woke up in the hospital two weeks ago after he lost consciousness when his military convoy was attacked. He says the convoy was ambushed by armed separatists as it escorted government officials to the southwestern town of Akwaya. He says he does not know how he got to the hospital and remembers only there was heavy shooting. Quartermaster Second-class Abaicho Abba has had parts of his legs amputated. He says he is sure the terrorists he was sent to infiltrate as an informant discovered his true identity. He says he got three gunshots to his legs when he fought back after three heavily armed men on motorcycles attacked him. He says he was dispatched to serve as an informant for Cameroon military. Aside from the hospital in Yaounde, 20 wounded persons are being treated at the military hospital in Cameroon's economic capital, Douala. Others are receiving treatment at hospitals in towns considered safer in the English-speaking northwest and southwest regions. The government says only complicated cases are referred to specialized military hospitals. FILE - Soldiers patrol in Bafut, in the northwest English-speaking region of Cameroon, Nov. 15, 2017. Violence broke out in the English-speaking northwest and southwest in November 2016 when a strike by English-speaking lawyers and teachers against what they said was marginalization by Cameroon's French-speaking majority degenerated into calls for secession. Suspected separatists torched schools and public buildings and the government responded with a crackdown. A year later, president Paul Biya declared war on the separatists, whom he labelled terrorists. FILE - A still image taken from a video shot on Oct. 1, 2017, shows protesters waving Ambazonian flags as they move forward towards barricades and police amid tear gas in the English-speaking city of Bamenda, Cameroon. Julius Ayuk Tabe, president of the self-declared breakaway English-speaking state of Ambazonia that is made up of the Anglophone regions, was arrested in Nigeria with 47 collaborators in January and extradited to Cameroon. They have not been seen since then. The armed separatists have vowed to continue fighting until they are released and are granted independence. More than 70 villages have been torched and the United Nations reports hundreds of thousands have fled to the forests and towns in the French speaking-regions. At least 20,000 have crossed into Nigeria. Two hundred have died and hundreds are missing.